Are you looking ways to send emails in Hindi, Tamil, Telugu, Kannada, or Malayalam. You can use the Gmail’s Indic Transliteration feature, to send email in Indian languages. Currently Hindi, Tamil, Telugu, Kannada and Malayalam are supported. When you type message in English, Gmail will automatically convert the word to its Indian local language equivalent (This feature need to be enabled ). This feature enhances the usability of the Gmail service for non-English users. For ex, “namaste” we will transliterate to Hindi “नमस्ते”, and “vanakkam” in Tamil will become “வணக்கம்”. Press Ctrl+g to toggle between English and selected language. Enable Enable Transliteration by checking the box [see pic ]. If you don’t see Enable Transliteration , click the Show all language options link first to see this option. Select default transliteration language (ex Hindi, Tamil, Telugu, Kannada or Malayalam). 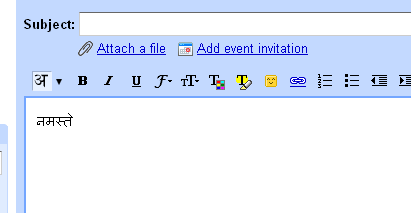 Go to Compose Mail page and click the language letter you set (one letter). Start typing mail in english. This will translate English words into your language. You can change the Indic Transliteration language in compose page. I can’t see the option “enable transliteration”. How can I view this option in my google settings. You are not seeing Enable Transliteration , click the Show all language options link to see this (Enable Transliteration)option. I don’t have the option enable transalation. I require it please send me this. Under the Settings/General Tab and for the language(1st item) select the check box against Enable Transliteration and then in the Drop Down Box for Default transliteration language select the language you want like telugu. Then click the Save changes button. When you open the Compose and type some words they are automatically converted into the language you selected above. I am unable to send my mails in Tamil. Is the Gmail Help desk team unable to understand the above message ????? so poor in English????? Please let the help desk team send a mail to my Mail ID sothat I can still explain very clear, stage by stage. On my PC in General Tab. there is such type option as mentioned above to solve the problem. I am unable to send e-mail in Hindi. Please help me. sir i din’t understand how to send mails in telugumfrom this gmail id one of my frd send mails in telugu inchating. how can i send pls give ans. i the picky gives correct sugestion. Please direct me how i can Install thesame in my computer. The picky is not responding why? not appear Despite my requests to Google this has not been done. Pl do needful to enable compose in Tamil.